I was never much of a pie person until I read Derek Munson's Enemy Pie. This great book deals with friendship and the author has a website filled with Enemy Pie-connected lesson ideas. I particularly like the idea of writing a personal recipe for Enemy Pie! To implement this idea with Wixie, divide the class into half and then into teams of two. Using the new Team feature for collaborative work, have student pairs work together to write their recipe. Ask one half of the class to write a recipe for Enemy Pie and the other half to write a recipe for Friendship Pie. Have students create pages for each ingredient, explaining why they chose it and how much is needed to make the pie. Have them paint a picture of the pie on the last page and share how they will share the pie. Visit with the teams as they work on their project to listen to their ideas about friendship. Share the recipes created by students and then read the story of Enemy Pie. Talk about the "ingredients" for the pie in the book, including their guesses for the actual food ingredients as well as for the "ingredient" of playing together for a day with an enemy. Use the ideas you collected from students during the recipe-creating process to foster discussion about friendship. If you work with emerging readers and writers, explore Charles G. Shaw's book “It Looked Like Spilt Milk.” In this pattern story, Shaw tells a story through images that sometimes look like spilt milk. The cadence of this story gives emerging readers confidence as they quickly learn the pattern and can "read" along with the story. You can also use the pattern, "sometimes it looked like _____, but it wasn't _____" to help emerging writers. Assign the "Spilt Milk" activity in Wixie to each of the students in your class. Have students use the Eraser tool on the paint panel to create their image and type the name for the image in the spaces to complete the sentence on their page. Expect inventive spelling. If you have someone to assist in your classroom, have each student record their sentence as well to build fluency and reading confidence. Once each student has completed their page, combine individual student work into a single Wixie file. Present it to the class, print it for students to take home, or export as an ePub so students can read it on a tablet at home. You can also create this book as part of a station rotation. Simply open the activity page on your computer or interactive white board and have each student complete with your help. Just remember to duplicate the template page before each student begins. Talk to your elementary or intermediate students about the phrase “Don’t Cry Over Spilt Milk.” Do they know what it really means? Talk about figurative language and see if students can come up with other example of idioms - phrases that have meaning different from the literal meaning of the words they contain. Create a list of idioms as a class. 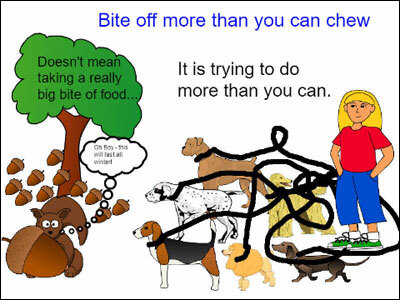 Have each student choose a unique idiom and use Wixie to create a page that demonstrates the literal and figurative meaning of the phrase (lesson plan on Creative Educator). Print the images and post as a figurative language collection to help other students at school better understand idiomatic language. Share any of your projects on Twitter and make sure to tag @Tech4Learning or #Wixie. You can also share your lessons or finished projects on the Wixie by Tech4Learning Facebook page.